Multiparameter flow cytometry studies were performed on cells from the primary tumors of 94 patients with breast cancer. Correlated cellular measurements of cell DNA content, Her-2/neu, epidermal growth factor receptor (EGFR), and p21ras levels were performed on each of 5,000 to 100,000 cells from each tumor. When criteria for positivity were matched with those in common use for immunohistochemical studies, 28 of 94 (30\%) breast cancers were classified as positive for Her-2/neu overexpression. When similar criteria were applied to the EGFR measurements, 23 of 94 (24\%) cases were classified as positive for EGFR overexpression. Similarly, 23 of 94 (24\%) cases were classified as positive for p21ras overexpression. By conventional flow cytometric criteria for DNA ploidy, 24 cases were diploid, 28 were tetraploid, and 42 were aneuploid. When the measurements were treated as separate sets of data, the only statistically significant correlations noted were the high frequency of diploid tumors, which did not overexpress any of the three oncogenes studied (P < 0.05), and an association between Her-2/neu overexpression and aneuploidy (P < 0.03). 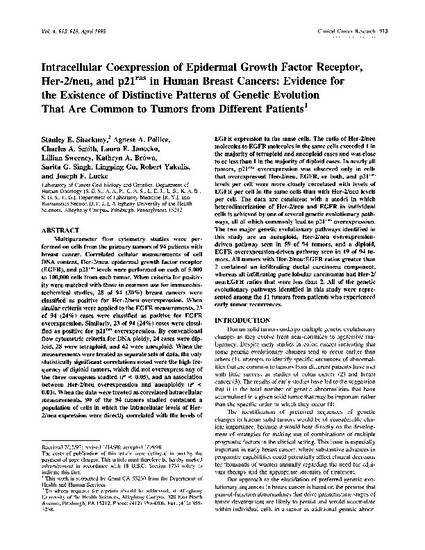 When the data were treated as correlated intracellular measurements, 90 of the 94 tumors studied contained a population of cells in which the intracellular levels of Her-2/neu expression were directly correlated with the levels of EGFR expression in the same cells. The ratio of Her-2/neu molecules to EGFR molecules in the same cells exceeded 1 in the majority of tetraploid and aneuploid cases and was close to or less than 1 in the majority of diploid cases. In nearly all tumors, p21ras overexpression was observed only in cells that overexpressed Her-2/neu, EGFR, or both, and p21ras levels per cell were more closely correlated with levels of EGFR per cell in the same cells than with Her-2/neu levels per cell. The data are consistent with a model in which heterodimerization of Her-2/neu and EGFR in individual cells is achieved by one of several genetic evolutionary pathways, all of which commonly lead to p21ras overexpression. The two major genetic evolutionary pathways identified in this study are an aneuploid, Her-2/neu overexpression-driven pathway seen in 59 of 94 tumors, and a diploid, EGFR overexpression-driven pathway seen in 19 of 94 tumors. All tumors with Her-2/neu:EGFR ratios greater than 2 contained an infiltrating ductal carcinoma component, whereas all infiltrating pure lobular carcinomas had Her-2/ neu:EGFR ratios that were less than 2. All of the genetic evolutionary pathways identified in this study were represented among the 11 tumors from patients who experienced early tumor recurrences.